Someone in one of the Reconnections Research Forums began complaining recently: "Hey, guys.....we've been talking an awful lot about light-bright stuff lately.......Language of Light, Crystal Cities, and so on. Whatever happened to integrating our Dark Side? What ever happened to the Shadow Work we all used to do?" For a moment, I was flabbergasted. 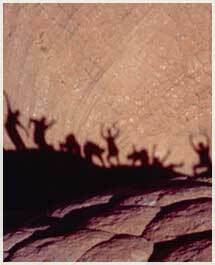 The Recon Forums have always paid special attention to integrating the shadow as a valid part of our Oneness. And we've had our share of debates and mini-brawls over the idea of how much of that nebulous "other" a person might choose to acknowledge as self. I had simply gotten used to it. Certain well-meaning people come and join into discussion with us, and they end up running out the door, saying......"You guys are evil! This Oneness stuff is from the Devil!" Oh yes we are, Brother John! And thanks for the reminder. But truly........ as I looked over some of the latest posts on our discussion lists, I had to admit that this concerned member was right. We had all grown considerably "light-oriented" of late. And now that I think more about it, I can understand why. The world news scene seems to have cornered the market on darkness. Why, then, wouldn't we want to lean hard in the direction of love and caring as we processed on the computer? Well.......I'll tell you why. The energies on this planet are moving very rapidly, my friends. What used to take years, now takes months. What used to take months now takes days. What used to take days now plays itself out in hours. It's called Potentiation of Energy, and there is no sign that it will be letting up anytime soon. We used to teach that people had to watch what they were saying or thinking, because entire universes are made from such stuff. At this velocity, a person is able to manifest a universe based merely upon an attitude! I'm not saying that this is particularly bad, but it certainly is worthy of some consideration and respect. The Recons have made no bones about how they feel about the subject of politics. They feel that it's contrived, unnatural, and......ultimately..... an enemy of all true expression and connection. "Through Politics.....you create a space called "society," where you form an agreement with them.....that you will all subjugate your spontaneous, authentic, in-the-moment choices and behavior to a pre- established protocol of expression (or repression)---to the desired end that you may live (peacefully, if possible) within a pre- fabricated, postured environment that looks good, sounds good, but inevitably ends up feeling quite empty and sad." DJ: Yes, indeed. Not a favorable impression, to be sure. And things get really exciting when politicians and world leaders start projecting shadows upon each other, demonizing their opposing forces so that they can justify doing things that no sane person would ever do, and still be able to sleep at night. Remember when George Bush Sr. was referred to, by many Mullahs, as "The Great Satan?" Shadows were certainly flying with that one. Actually, they're still flying today. The title has simply been transferred from father to son. And then, not to be outdone, the President rang some bells when he gave his famous "Axis of Evil" speech, just before the Iraqi War. What we dare not look at, within ourselves, we tend to project out onto others. That's the nature of shadow. The light (of awareness) shines from behind us, and seeks to project itself on the wall. But something (solidified) stands between the light and the wall. It's outline is what forms the shadow. What makes things solidify is resistance. And resistance plays a huge role in the development of 3D reality. That concept is well-illustrated in the Recon Transmission called "How Universes Are Formed." The physical world is our mirror, showing us all those aspects of character and spirit that we need to recognize and embrace as viable parts of who we all are. The more divergent certain elements appear to be, the more likely they are to dance with each other in a state of conflict. We, as Bridge People for the process of Ascension and Planetary Transformation, have a unique opportunity. If we choose, we can become a matrix for joining these divergent forces. We can take on both sides of a conflict, and hold them in a space of Oneness until their resistance stops. Can you imagine it? We're talking about two cats in a bag. It takes a resilient soul to do this! And this world is now filling with these types of souls. Every shadow that is projected outward holds a KEY which can open locks in the minds and hearts of the ones who do the projecting. The guilt and shame that goes along with projection are designed to deflect attention away from the hidden power that is held in the shadow. In a sense, we are locking ourselves in a prison cell and throwing away the key. When the Mullahs call George Bush a "Satan," it is because he displays attitudes and traits which they cannot abide within themselves. They want to exorcize those "demon traits" so that they will not infect their daily reality. When we attribute these traits to a world leader, all attention goes away from the recognition of of those qualities inside. In a sense, Bush becomes our scapegoat. The same is true about nations that have been grouped together as an "Axis of Evil" in the minds of our own people. In order for a person's finger to point at something, there must be three fingers pointing back at him. This is in the Code of Ethics that is oft presented when one is studying the Practice of Magic(k). Whatever you send out will ultimately return to you threefold. Whatever you judge or bless within another person will ultimately come back to you--as a blessing or as a curse..
All truth passes through three stages. First, it is ridiculed, second it is violently opposed, and third, it is accepted as self-evident." (Arthur Schopenhauer, 1788-1860). Ultimately, shadow projection is the first stage of a major awakening. But it's sort of a roundabout way of doing things. Many folks on the planet today are crying out: "This transformation business is taking way too long! Why can't we just get on with things, so we can enjoy life instead of struggling with it?" In truth, we are being slowed down in our expansion because we refuse to integrate our shadows. Robert Green Ingalls said: "In nature there are neither rewards nor punishments--there are consequences." We aren't being singled out for punishment, we are merely experiencing the consequences of our own rigidity. If we choose security over change, we have to suffer the consequences. As Gail Sheehy summarizes succinctly: "If we don't change, we don't grow. If we don't grow, we are not really living. Growth demands a temporary surrender of security." We can learn how to recognize our own rigidity and how to correct it. It takes honesty and courage, but the rewards are immense. First, the suffering stops. This is the surest sign that we have chosen the right path again: the unnecessary suffering stops. More importantly, new possibilities open up everywhere in our life. Where everything seemed sterile and barren, and there seemed no possible answers, now everything seems possible. The possibilities may be scary, because each offers a path that we have never taken before, but it's a good kind of fear, like the fear that a fine pianist experiences before a concert. from "Shadow Dancing" by Robin Robertson. Shadow Teachers appear in a person's life for one of two reasons. First, they come to show him something about himself that he has been failing to notice. They wear it for him, like a coat. We know that the shadows are his because, when he looks at them, he goes into a state of emotional react. The emotional "charge" is the giveaway. If a quality or trait wasn't already in us, we would walk right by it and feel fairly neutral in its presence. Dark Shadows show us things which we already are, but don't want to be. Or, perhaps they show us a trait or quality that we haven't been using, that now needs to be accentuated in our life. That is the second reason we attract them in. Golden Shadows show us things we love and admire, which we dare not believe that we could ever have or be. Both of these reflections come to teach us more about ourselves and the next levels of our growth path. The Shadow Dance that is now going on in the Middle East is pitting the traits and ideals of the West against those of the East. One side of the equation presents itself as being very "moral," level-headed and fair. The other side presents itself as being chaotic, passionate, and wild. Each side is carrying Shadow Lessons for the other. When an irresistible force meets an immovable object, the result is a MERGE of those opposing forces. How could it be otherwise? When the U.S. entered Iraq, they expected that victory would be assured. We felt it would be a "slam-dunk." America had superior fire-power, and we had more personnel to bring to the party. After an initial engagement, the battle was declared to be over, and the President put on his flight suit, climbed aboard an aircraft carrier, and waved his victory flags before the world. Then, the real battle began. When the opposition uses our shadow traits against us, we can be caught blind, with our pants down. Superior fire-power can be overcome with stealth, infiltration, expert timing, and rugged desperation. It's David and Goliath, played out in an entirely new setting. The traits that are severely troubling the U.S. military in Iraq now are the same ones that helped the U.S. defeat the British during the American Revolution. A rag-tag group of farmers and locals go up against a well-established military "machine," in order to save their homes and families from occupation by a foreign power. Do we get that? They're fighting to save their homes and families! And yes, there are ruthless (potential) dictators among those families and homeowners. But that potential exists on all sides. Back in the U.S., politicians are trying to assess "how much is this war going to cost the American people?" On this side of the ocean, life goes on as it always has. Folks watch cable TV, eat cheeseburgers, and go to the theater. For many Americans, this war is just an image on the TV. In Iraq, people know how much this war is costing them. It's costing them EVERYTHING! Herein is the difference. That difference of perspective was the "edge" America had, back in 1776, and it's the edge the Iraqis have now. They're fighting to survive. America is fighting to prove a point, to make an impression. And yes, not all Iraqis are at war with us. But those who are seem to be causing quite a stir, aren't they? And the more objective onlookers in the world will always sympathetic to the "home team" when someone from outside their country is trying to move in. If Russian or Chinese tanks were wheeling through downtown Los Angeles, taking up strategic positions near the center of town, there would be little debate about whether or not America should institute a draft. In Iraq, parents are strapping bombs to their children and sending them to whittle us down--soldier by soldier---explosion by explosion. That is their way. They are on "home" turf.........which, by the way, is the only place wars really need to be fought. As Mr. Miyagi said, in "The Karate Kid" movie......"Karate for defense only." That could be true for all weapons of war. The party that is advancing upon you is threatening to do away with your way of life, and replace it with theirs. In such a situation, passion (and commitment) will tend to run high. The danger isn't conceptual or virtual, then. The dragon is breathing down the back of your neck. One of the primary reasons the U.S. wanted to topple Saddam Hussein was: He was insensitive to human rights, and he abused and tortured people. We entered his country, went head to head with that "Demon Trait," and look what we've become. The Associated Press is sizzling with pictures and reports of U.S. insensitivity and torture of people in Iraq. War does this to people. It peels back layers of the human facade and reveals more of what is underneath. This is true........both of the bestial elements and also of nobility. Am I complaining? Well......as an American, I find myself distressed and dismayed, to see my fellow citizens acting in this unbalanced way. After all, they are my mirror, too. But as a fragment of The Oneness, I am instructed and expanded through these types of lessons. Every new journey tells us more about who we are, and what we now have to do. It is clear that this had to happen. The world needs these lessons, otherwise we would not have been allowed to do this. After 9/11, people yelled: "Fight Fire With Fire!" I've always wondered about that expression. Don't you just get more fire that way? Isn't fire most effectively fought with water? As "punishment" for the American abuse of Iraqis, some Middle East locals decided to behead an American on video and send it to the world press. Though this action is obviously horrible and reprehensible, The Recons showed me that there is also a kind of symbolism to this. When you cut off a person's head, the center of personal realization has to move a little bit further down the body. The heart, not the head, must be our center of processing and responding to what is before us. The heart chakra is our new conjunction place for mind (head) and emotion (gut). It was once said: "Sometimes, you need to go out of your head in order to come to your senses." As more and more American bodies come home from Iraq in flag-draped coffins, the sleeping people of America are beginning to feel a tiny portion of the same horror that is daily fare for the average Iraqi citizen. As feeling enters the picture, awareness begins to dawn. Expanded awareness brings the only healing that is necessary in life. Now is the time for true Shadow Work to begin. We need to begin Fighting the Inner War that has been going on in all of us. To be or not to be, that is the question. When you're being openly attacked, on your own home soil, you get around to dealing with these issues in short order. If you're not, you'll hit the snooze alarm and roll over to catch a few more winks of sleep. We have met the enemy, and he is us. Each of us. He is Iraqi, he is British, he is American, he is Chinese, he is Russian........ he is ALL OF US..........and he is none of us. In truth, he is not really an enemy at all. He is a teacher, a dark reflection in the 3D mirror. He is also an orphan, cast out of our consciousness, and wandering the dark streets of our Collective Unconscious. Can you see his face yet, pressed against the window of your mind? "Sometimes, it becomes necessary for the ONE to take on the MANY, and to hold that tone............until the MANY are ready to become ONE." "To realize that there is ONLY ONE......regardless of that One's various masks and faces, smiles, tears, or overt actions ......is the beginning of a new world, right then and there. And it only takes One, for that is all there really is, or ever was! As this One begins to own each "other" one, and another, and another, as self......continually expanding his or her identity....and sentience of self---an innate force of personal homeostasis begins to take over. It isn't a "negotiated peace" at all. It is now, and always was inbred. Natural. Quite efficient, really. In a Reconnected World, as in an aware, functional human body......the instinct for self-preservation always ends up reigning supreme. All AS One, One AS All. Every man for himself. But friends......what a "self" ye all are! Focus! Realize! Relax into it! You'll be amazed. Indeed, it is a fearsome premise. To lay aside struggle, cleverness, and social manipulation (especially manipulation of your own self).....in favor of pure, childlike TRUTH, DESIRE, and SIMPLICITY. But this, My Dear Friends, is the path that spreads itself before you now. Soon, it will the only ground upon which you can safely or comfortably stand." DJ: Chehala Selah! There is a songfest going on now, within The Crystal City. It is a song meant for all humankind. The reverberations of this music are growing and changing with each passing day. Each person hears this song and its lyrics in his own way.....each one moving to the beat of a different drummer. Remember the son of that friend of mine who was in the Middle East.........the one I mentioned in my article "Star Children In Iraq?" He's already been home once and back again to the front line. A few weeks ago, he caught some shrapnel from a hand grenade and was sent back home again. I had him on my therapy table this week, and he's doing fine. When I put my hands on him, I sent all of our energy through him to those like him in that difficult place. Young people. The newly awakening potential of humankind. This process is but a dream, and you are the Dreamer. Go inside. 0wn it, be with it, feel it. The soldiers on the front line will do their work. Be sure that you do yours. Awareness is the only healing that is necessary. It's always been with you, you just have to reach out and claim it. When you own the rage, the hunger, the madness as self........the children will begin to be fed and loved again. Now go. Be with what we have shared. The "marching orders" will be issued when you are upon the road. Be done with this Terrorism. Be done with numbness and repose. Let the Captains of the World rattle their sabres, even as your inner work shakes them right down to their core. Armaggedon is, indeed, being fought............ not with swords, or on ANY one nation's soil.........but in the fields of the human heart. They can either be "killing fields"........or they can bring forth a bounty of love and splendour. The choice is yours. The time for decision is now." DJ: That's the way it begins. And then it grows and grows. It's all perfect, yet it isn't always easy. The times they are a'changin'..........as Bobby Dylan so aptly put it, way back when. Along with them, hearts are now changing, too. **"I Am The Walrus" words and music by John Lennon and Paul McCartney. Copyright, 1967.